Posted on October 14, 2007 March 23, 2019 by Pavel Y.
В общем достаю из архива. A Pegu Cocktail is one of my favorite drinks. Undoubtedly, this cocktail demands a detailed investigation and a place (maybe … fifth or sixth) in my TOP of Drink by Scomorokh. Muddle limes, curacao, and bitters in a mixing glass. Add gin and ice and shake. Strain into a chilled cocktail glass. Garnish with a lime peel. 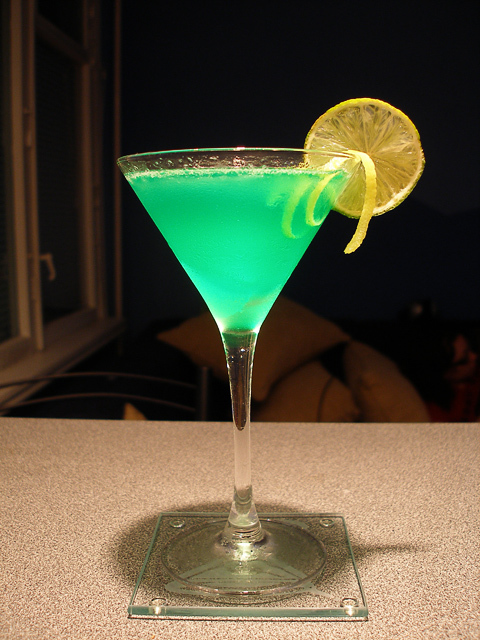 You may ask why it looks so green :) It is my … zest :) (Actually, I don’t have orange curacao in my bar, only green and blue).